Earth Day 2018 - Make Fitness Green! Earth Day is quickly approaching and I was recently asked how can I tie fitness and going green together. I know that many of us don't think about it but there are many ways you can make fitness more green from where we exercise, how we fuel our bodies to donating our retired running shoes once the "big race" is done. Here's some of the methods I've found and have started to implement in to my own workout routine to be sure I reduce my own carbon footprint as it relates to fitness. 1. DITCH DISPOSABLE WATER BOTTLES! 1. It's really easy to grab a bottle of water at the local corner deli or even at the studio you take class or workout at but you can reduce your carbon footprint drastically by bringing your own and filling it up! Try to find one that is BPA free or even get a stainless steel or glass bottle (if you aren't afraid of dropping and shattering it). I personally love my Hydro Flask Double Walled Bottle since it is designed to keep my water cool on a hot day. It's got a BPA free cap and it wide mouthed for easy access (although you will sometimes spill if you are drinking too fast). 2. AIR DRY YOUR WORKOUT GEAR! 2. I know it seems time consuming but if you take the time to air dry your workout gear you not only reduce your carbon footprint by not having to run the dryer as long (or at all) you prolong the life of your workout gear which, in this day and age, we usually spend some decent $$$ on. Hot dryers tend to "fry" the elastic in our workout gear and they stretch-out and lose their support when there is no elastic to hold you together. They also fade those bring vibrant colors that can help motivate you! Your body, you mind and the Earth will thank you. 3. 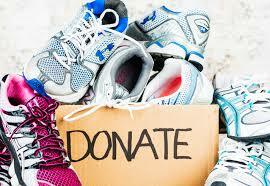 DONATE YOUR RUNNING SHOES! 4. Part of heathy living and reaching health and fitness goals is fueling your body with proper food. Planting a garden not only helps lower your carbon footprint but also provides you and your family a source of nutritious locally grown herbs and vegetables. Fuel your fitness and plant a garden even a small herb garden can be kept in an apartment window. 5. Take your fitness to the great outdoors! Working out outside helps save energy by reducing the amount of air conditioning being run and lights that are on. Plus working outside gives you a perk with fresh air and sunshine. Be sure to wear sunscreen and hydrate. An outdoor workout rather than an indoor one is a great way to easily take your fitness to the next level of GREEN. Are you ready to make your workouts GREEN?